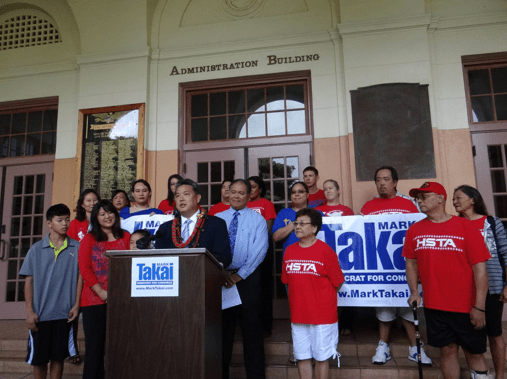 HONOLULU – The Hawaii State Teachers Association (HSTA) and the National Education Association (NEA) announced its endorsement of Mark Takai in his congressional bid to represent Hawaii in Washington, D.C. Numerous public school teachers, including HSTA President Wil Okabe and Nikki Takai, who teaches math at Pearl City High School and is Mark’s youngest sister, were present at the announcement. “While a member of the Hawaii State Legislature, Mark Takai has always demonstrated a strong level of support and respect for Hawaii public school teachers and the education profession,” Okabe said at the press conference at McKinley High School. Takai, who graduated from Pearl City High School (PCHS), has been a leader on education initiatives in the Hawaii State Legislature for the past 19 years. Ishihara spoke fondly of Takai when he “single-handedly planned” a youth parade as PCHS student president. The students marched through the community encouraging the people to vote, Ishihara noted. “That (parade) demonstrated from an early age that Mark Takai realized the importance of serving the community,” Ishihara said. “I’m tired of all the right wing teacher bashing coming from Washington. I know first-hand the value of public education in Hawaii, as my wife and I send our two children to public schools,” said Takai, who was joined by his wife Sami and children, Matthew and Kaila. “As a product of Hawaii’s public school system, Mark Takai has a clear understanding of the needs and challenges facing our educational system,” Okabe said. “His support of teacher training, higher entry-level salaries, and better compensation for all teachers is only a small portion of his efforts to help better Hawaii’s schools. And we are confident that Mark Takai will be an effective voice for our community in Congress,” Okabe added. “Good teachers are essential to our communities and our country. I was blessed with great opportunities to serve because of the education I received here in Hawaii. It is vital that we continue to create great opportunities for our future generations, and I intend to lead that fight in Congress,” Takai said. Takai served as the chair of the Hawaii House Higher Education Committee where he authored the Hawaii College Saving Program. He also discovered Hawaii was not participating in an obscure provision of the U.S. Department of Education Impact Aid Program. Through diligent work, Takai recovered almost 40 million dollars in lost federal funds to the Hawaii public school system. “Education has been a linchpin in my career in the legislature. If elected to Congress, I will roll up my sleeves and fight for public education, students, and teachers,” Takai said. HSTA is the exclusive representative of more than 13,000 public school teachers statewide. As the state affiliate of the 2.2-million member National Education Association, HSTA represents and supports teachers in collective bargaining, as well as with legislative and professional development issues. Candidates seeking the HSTA recommendation completed a vigorous review process that included research of voting records, written responses on education issues, and an interview with teachers on the HSTA Government Relations Committee. After much deliberation, the Committee recommendations were approved by the HSTA Board of Directors. The HSTA Government Relations Committee and Board of Directors are composed of teachers from every island. They are volunteers who are elected by teachers from the districts they serve. The President of HSTA is a teacher on release time from his assigned school and elected by all of the teacher members. HSTA’s teacher leaders set the course for action in the Association.